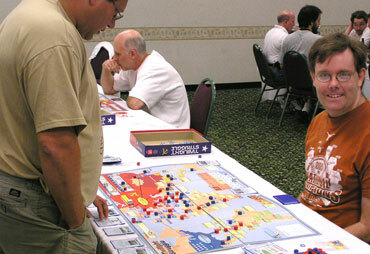 Twilight Struggle was the hottest new game this year, The dual track space race and political control subject had "crossover" potential that interested both wargamers and Euro fans. You could tell which players had already logged considerable time with the new release - they had customized their games by replacing the control counters with colored wooden blocks. The Supreme People's Designers are proud to announce that the capitalist bourgeois convention organizers yielded to world opinion and included Twilight Struggle in their so-called World Boardgame Championships. The competition was short, brutal and successful—like the attacks of our heroes at Stalingrad. As predicted, by Comrade Lenin, the scarcity of natural resources—in this case wood—lead to intense competition among 70 members of the oppressive class. After five rounds of see-saw struggle, we can report that the world remains safe for the worker's paradise. Our Supreme Leader has singled out two workers for praise. Comrades Rick Young and Doug Austin are models of the New Soviet Man to which we all must aspire. While battling masterfully in the tournament, Comrade Young also led the workers movement in central tournament planning. He anticipated every effort by counter-revolutionaries to derail the competition. Comrade Austin overcame even greater hurdles to assist with the tournament. While fighting for the motherland on the home front (a marriage and move), he nevertheless volunteered for this arduous and dangerous duty. These models of Soviet accomplishment had the desired effect on the capitalist participants. Worker harmony was everywhere in evidence. Imperialist propaganda had suggested that a tournament of workers with a new card driven game and unfamiliar rules could never work. They were proven wrong. 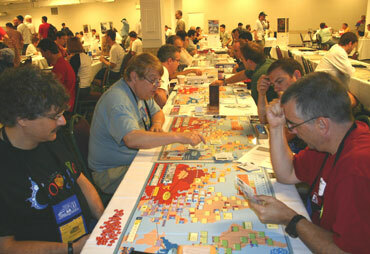 Worse, some counter- revolutionary swine on Consimworld, claimed that the People's work product had been rigged. They brazenly claimed that the People's victories in Twilight Struggle were due to imbalance rather than our superior social system. However, the lies of these Tsarist Cossacks have been revealed for all the world to see. In the first round of the tournament, the capitalist dogs won 45% of the time. In the second round, the dictatorship of the proletariat opened up a sizeable lead with 69% of the wins. The third round is known as the golden round, as the People's Soviets won every game. Sadly, through espionage and deceit, the lapdogs of western imperialism staged a come back. In the semi-final round, half of the heroes of the Revolution fell to Yankee capitalists. Even more disheartening, comrades, in the Final, the Americans prevailed against our valiant party of worker unity. Not since Lake Placid has our shame been greater. The great enemy of the People is known as Stefan MeCay. This was his "first time" at the WBC under this alias. 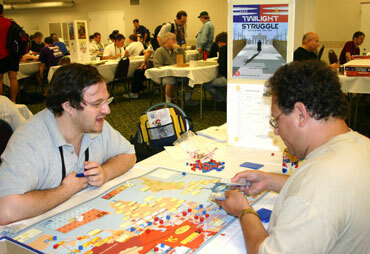 Yet mysteriously, he was able to win the People's game Twilight Struggle, and gain the Final in Wilderness War. We have asked the authorities to test MeCay for the illegitimate use of performance enhancing drugs. As Comrade Lenin taught us, a lie repeated often enough becomes the truth. Here then, is the account of the enemy of the People, Stefan MeCay, concerning his "victory:"
"The start was wild right from the headline phase as John Emery played the Red Scare and I had containment for a push, otherwise I'd have been in trouble early. I also had a powerful starting hand, so was able to grab the Middle East early and get three points and one point for Europe. Turn 2 saw us both racing for Asia as the last scoring card left, but it didn't come until Turn 3 when I was able to purge him back. This let me get an early jump on Africa and the western hemisphere. A common theme for John as for all my opponents was horrible luck on Coups. It seemed like whenever he would coup me, he'd get a "1" or "2" and he had a lot of "5's" and "6's" on the space race. My luck was average, but compared to terrible, average is pretty good. I had the early momentum, but John did a great job of battling and keeping the game close until turn 7 when the score was US+7. I had the Alliance for Progress in the headline phase for five points and as we reshuffled, I knew he had both the S. America Scoring card and SE Asia scoring card which I controlled for five and six more respectively. 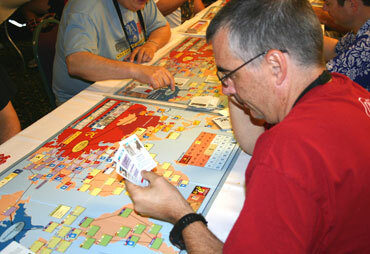 He tried a quick coup in Argentina, but as was the norm of the game rolled a 1 so I was able to fill it back up. He went ahead and scored it as he had no choice, so it was US+17. He rallied late in the turn by successfully doing a Brush War in Thailand which pushed the VP's back to +16 and only +3 for SE Asia, but I used the China card to contest control. He put more influence into it, and I coughed up the Muslim revolt to contest it again and he was forced to score SE Asia as his last play which gave me the auto-win. It was a fun game, very well played by both, and John is a great guy and a lot of fun to play with." Finally, despite these setbacks, players flocked to the Soviet cause. The average bid tournament wide was 0.7 for the Soviets side during the tournament. This is further proof that the allure of the worker's paradise proves irresistible to those who are exposed to it. Thank you, comrades for your kind attention. We look forward to victory next year and long live the revolution! 35 first round games stretched from aisle to aisle. Stefan Mecay (right) had Marvin Birnbaum on the ropes.